The 64th Jio Filmfare Awards South 2017, an initiative of the Times Group, was an evening dominated by prominent personalities from the film fraternity, such as A.R Rahman, Prakash Raj, Khushboo, R Madhavan Allu Arjun, LakshmI Manchu Samantha Prabhu, Rana Daggubati, Comedian Ali, Trisha, Sudheer Babu, Regina Cassandra, Suriya, Pragya Jaiswal, Lavanya Tripathi, and many more. With the best of the South fraternity gathered under one roof, it was a fun-filled evening for the stars and the audiences alike. The highlight of the evening at HICC Novotel in Hyderabad was to see the stars win make heartfelt speeches as they took home the coveted black lady with pride. 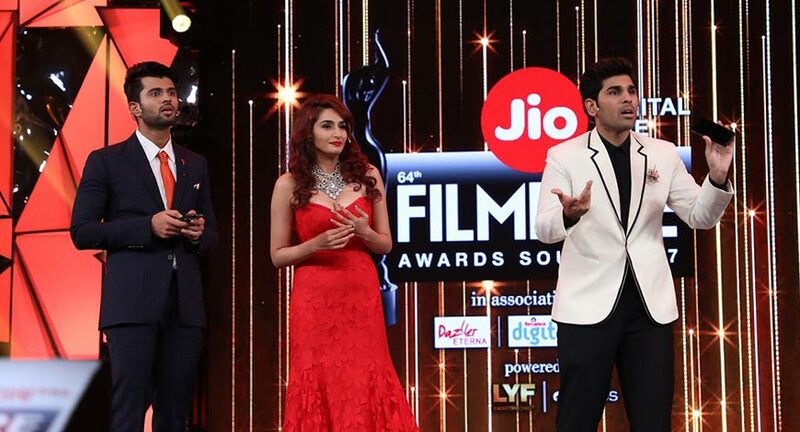 The red carpet of the 64th Jio Filmfare Awards South 2017 was an extravagant affair, with stars dressed in their absolute best walking the red carpet. The title sponsor for the event was Jio and the associate sponsors were Dazller Eterna, Reliance Digital and Luker. The awards were powered by LYF and Reliance Trends. Television partners are (Tamil) Vijay Tv, (Telugu) Maa Tv, (Kannada)Suvarna TV and (Malayalam) Asia Net. Metal partner is Luminex Uno, Online Jewellery Partner is Nakshatra World, Radio Partner is Radio Mirchi, Multiplex Partner is Orienta Cine Advertising, Trophy Partner is The Award Gallery, Outdoor Partner is Prakash Arts, Hospitality Partner is Hyderabad International Convention Center & Novotel, Event Management by Fountainhead, Technical Direction & Stage Management by On Cue Productions and Acts were conceptualized & choreographed by Satish Krishnan.